One 'three phase transformer' occupies less space than a gang of three 'single phase transformers'. 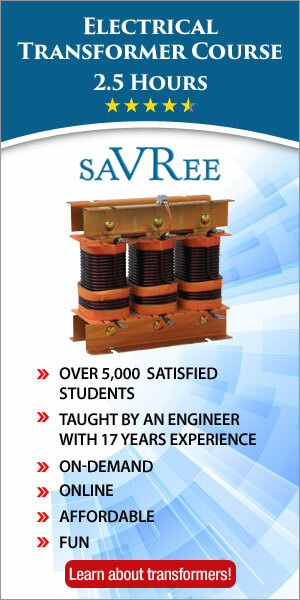 The overall bus-bar structure, switchgear and installation of 'three phase transformer' is simpler. Three phase transformers can be of core type or shell type (just like single phase transformers). The constructional details of core type as well as shell type three phase transformers are as follows. 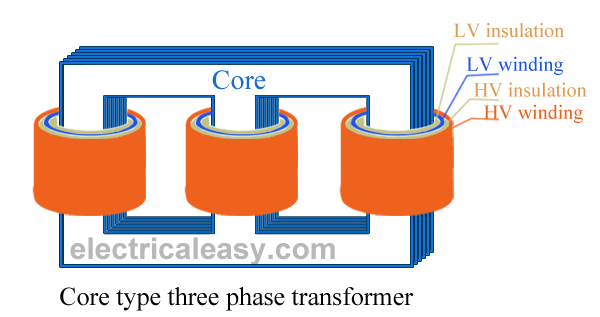 The construction of a core type three phase transformer is as shown in the figure. The core consists of three legs or limbs. As usual, the core is made up of thin laminated sheets to reduce eddy current losses. Each limb has primary and secondary windings in cylindrical shape (former wound) arranged concentrically. The construction is well illustrated in the figure. 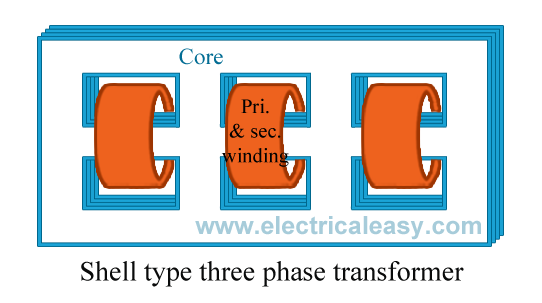 In a shell type three phase transformer, three phases are more independent than they are in core type. Each phase has its individual magnetic circuit. The construction of shell type three phase transformer is illustrated in the figure at right. The construction is similar to that of three single phase shell type transformers kept on the top of each other. The basic working principle of a three phase transformer is similar to the working principle of a single phase transformer. Power from primary is transferred to the secondary by the phenomenon of mutual induction. The main drawback in a three phase transformer is that, even if fault occurs in one phase, the whole transformer is removed from service for repairs.